Stonington is great for meeting up with crew as the train stops right there in town. Stonington is also very protected, has a host of marine services, many re-provisioning options, and a quaint historic New England village. In fact, it’s a great destination of its own right, especially on the day of the blessing of the fleet. It’s one of the few remaining harbors with a substantial commercial fishing fleet, and the parade of ships on that day is a true spectacle. The town is a pleasant walk from Dodson’s, and there are major supermarkets, antique stores, and a fresh produce market on weekends. DuBois Point Beach is ¾ mi down Water Street . Dodson’s Boatyard in Stonington is a main attraction for cruising sailors offering moorings, showers, a restaurant, and a launch. You can reach them at 860-535-1507 or VHF channel 78. 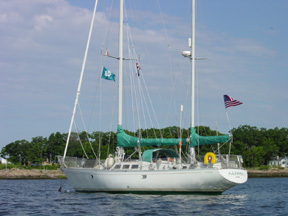 The new Stonington Harbor Yacht Club is now open as of the Fall of 2005 and has posted a listing of reciprocal clubs. We’ll cover more about this destination in future close-ups, but for now, we're just using Stonington as our departure port for our weeklong cruise. A fleet exiting the inner harbor in tandem on a foggy morning. The commercial fishing docks are to the right.